Published on Sunday, May 22, 2011. 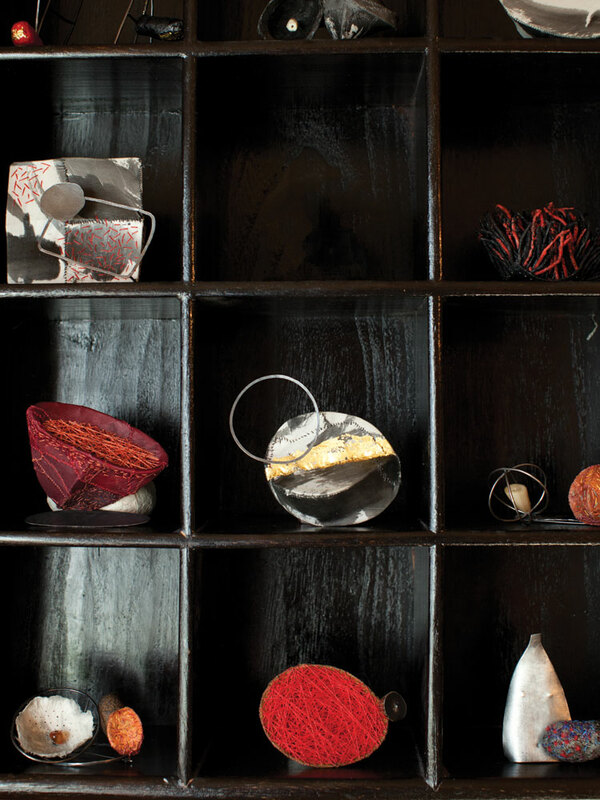 This article appears in the June/July 2011 issue of American Craft Magazine. 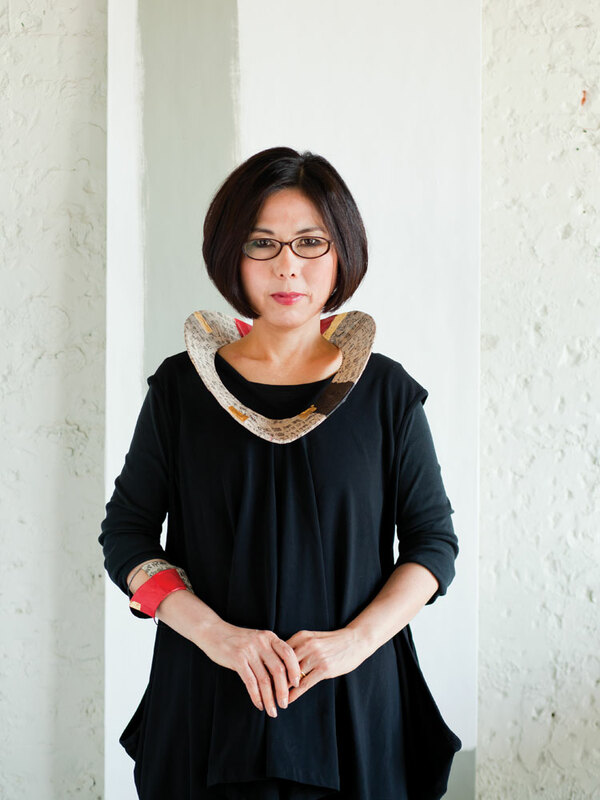 Myung Urso, who's been making her jewelry for only four years, may seem like an overnight success, but she's been immersed in the study and practice of craft since childhood. Cocoons. Loofah. Rubber bands. Coral beads. Silk from her husband's old shirts. Paper made from mulberry trees. White cotton marked with calligraphy as fierce as graffiti. 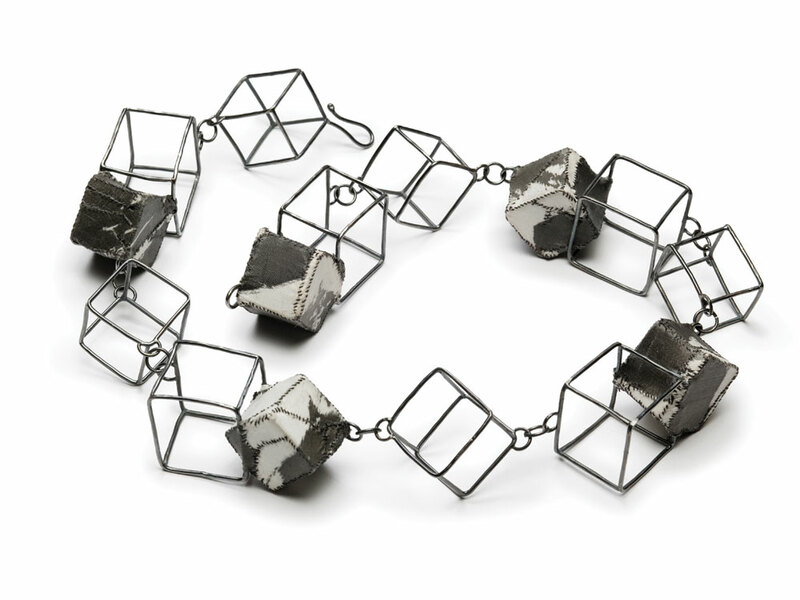 Those are among the motley materials Myung Urso combines in startling juxtapositions on the frames of sterling silver she oxidizes and fabricates in her Rochester, New York, studio. "Each piece is born rather than I make," she says, stitching cotton into a taut tent over a small silver cage destined to become a brooch. "It's not possible to make it again; it just happens." 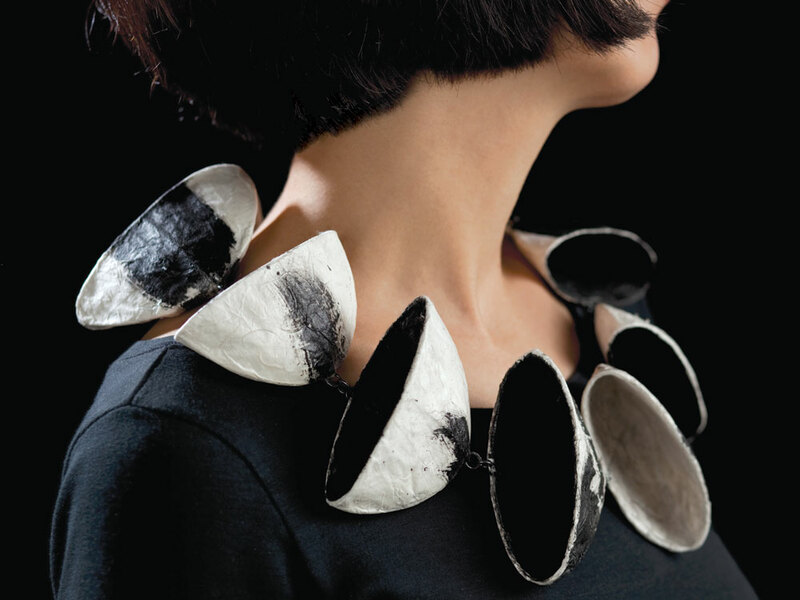 Urso's one-of-a-kind brooches, necklaces, bracelets, and earrings have captured the attention of discerning curators and collectors, and earned top honors at the ACC's 2011 Baltimore show. Her pieces sell from about $200 to $4,000. 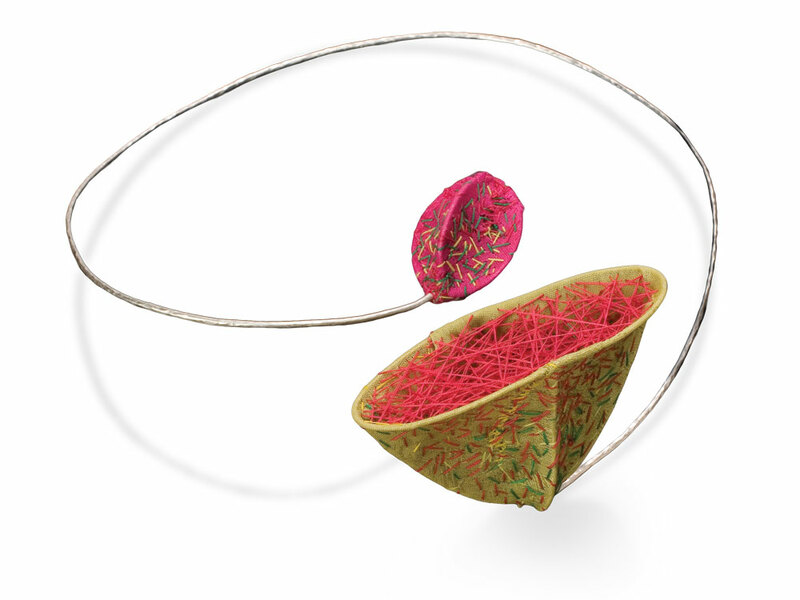 The artist also gets raves from seasoned gallery owners, such as Ivan and Allison Barnett, who carry her work in their Patina Gallery in Santa Fe, New Mexico. "She'll be one of the most important jewelry makers to watch," says Ivan. "She has a lot more leeway to grow because her materials are not precious." Adds Allison: "She has a great way of creating mass without weight." in an industrial building downtown. Urso chuckles when she compares her sudden success to moso, a kind of bamboo that can sit dormant for several years, then burst through the soil, often soaring as high as 90 feet within weeks - possible because all along it had been quietly sending out deep, wide roots. Urso's roots lie in the small, mountainous town of Okcheon, South Korea, where she was born in 1960, the fourth of six siblings. Myung-ok Jeon grew up amid her country's struggle to recover from war and its efforts to become Westernized. In school, she was taught to speak English, make American food, and eat with a knife and fork. She wore American-style clothing and watched American TV shows like The Waltons and Hawaii Five-O. But she also learned traditional Korean calligraphy and absorbed ancient Korean customs by helping her mother mend clothing, make rice cakes, and harvest wild vegetables to dry in the sun. Every autumn, to keep out winter's cold but let light in to their rustic house, she and her mother would cover the door and window openings, which had no glass, with thick hanji, Korean mulberry paper. Then they'd layer it with dried gingko and maple leaves and spray it with water to tighten the fibers. "I liked to work with my hands; it is a meditation," Urso says. "But my hand skills were clumsy, not perfect." And becoming an artist was not an option in those lean times, she says. "I didn't have any big dreams growing up. I was just a plain little girl." 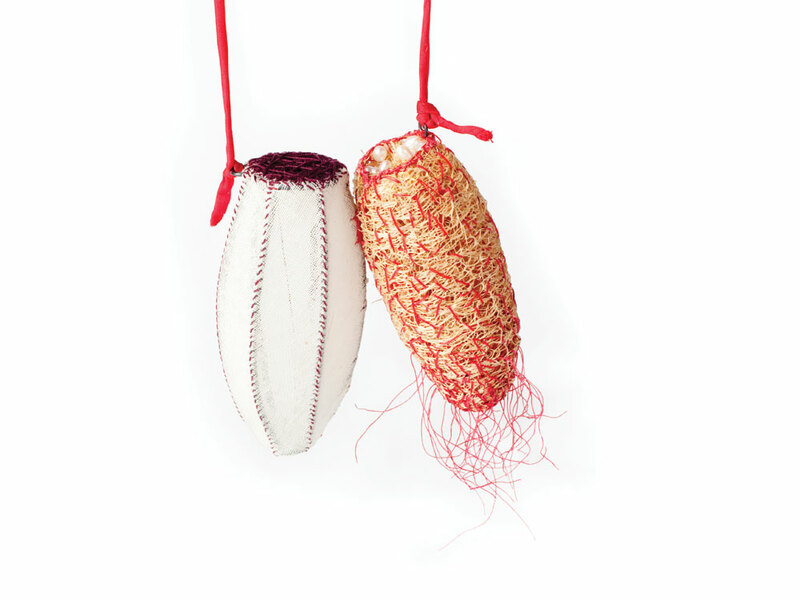 She studied biology at Soong Jun University, then taught it in high school for two years, until a budding passion for fiber arts led her to Hongik University in Seoul. 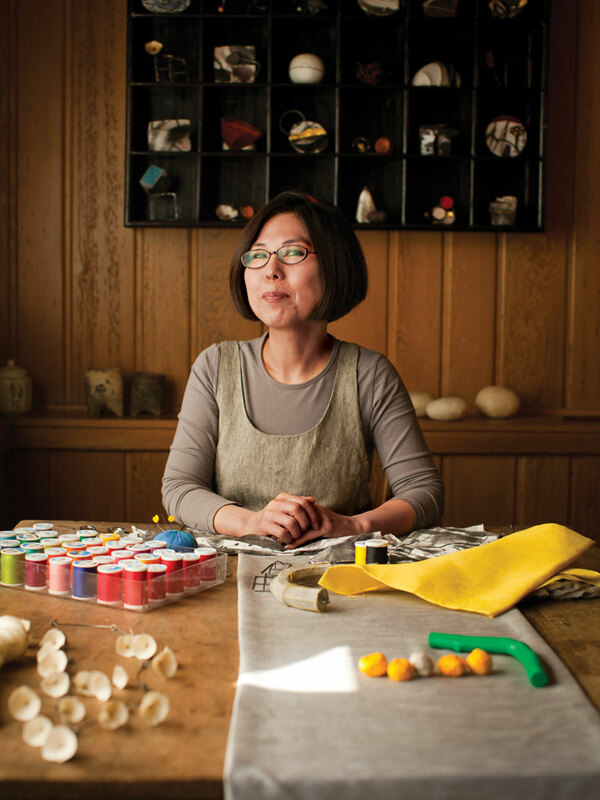 Equipped with an MFA, she reported and edited stories about traditional and contemporary Korean crafts for Monthly Art & Craft magazine in Seoul. 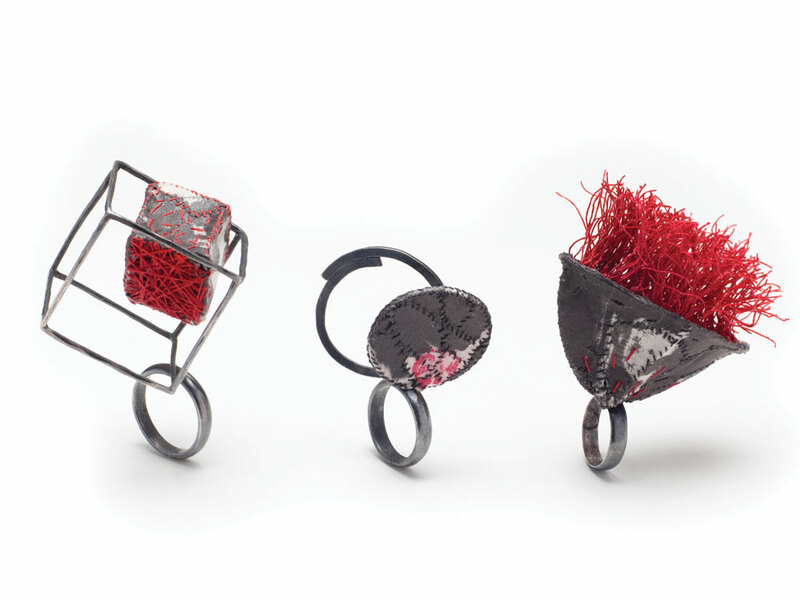 A desire to promote Korean crafts drew her to London, where she earned her master's in museum and gallery management from City University in 1995, and worked with the British Crafts Council to organize exhibitions. 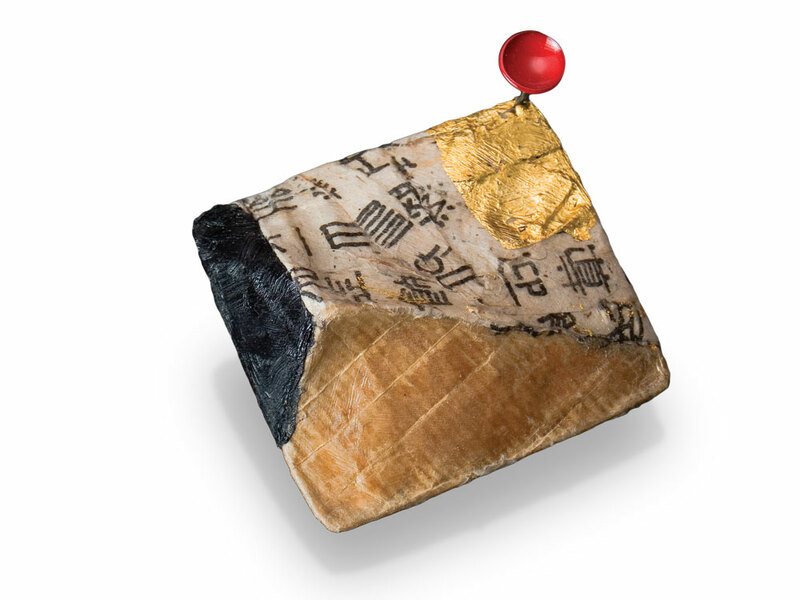 Returning to Seoul in 1997, she opened Hand and Mind Gallery, which exposed her to the work of artists throughout the world. Among them was Leonard Urso, a friend of a friend, and a professor at Rochester Institute of Technology's School for American Crafts. 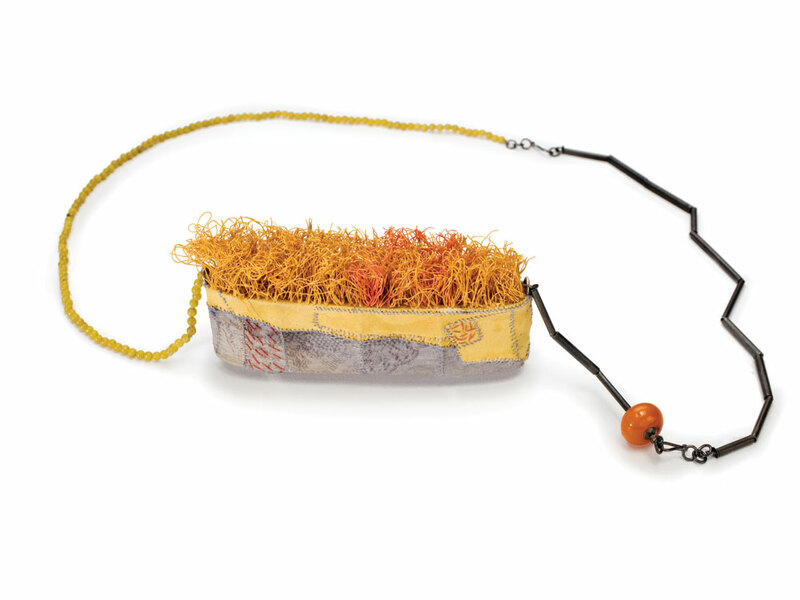 She included Leonard's jewelry in a 2001 show, and the two met at the opening. Their friendship blossomed into marriage, which brought her to Rochester. After moving into the house they chose together, on a wooded lot at the edge of the city, Urso took a year to decompress and take care of herself, her new husband, their dog, and two cats. "Never before did I have time to have a relationship with animals," she says. "My heart became softened, and I had more space to think of life." She also had time - and the encouragement of Leonard and her younger sister, Mindy Myunghee Jeon - to think about creating her own art. 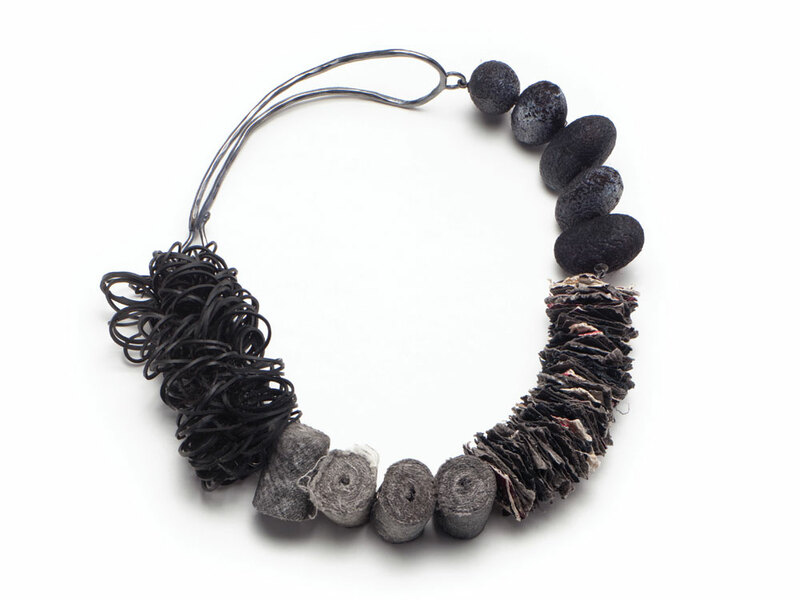 In 2007, she began studying jewelry-making with Faruk Kaiyum at the University of Rochester's Memorial Art Gallery. Having organized more than 50 exhibitions and curated the work of hundreds of artists, Urso feared she might inadvertently copy them. But what emerged was a distinctive fusion of East and West, of ancient and contemporary, that continues to surprise her and her admirers. "In Korea, we have to fit ourselves in the box. Everybody has to be similar," she says. "You are under control yet have to be creative. That makes the art really powerful coming out." Her power, she says, is boosted by American enthusiasm for her work - from collectors such as Liz Grubow, an executive who lives near Cincinnati and travels the world designing brand identities for beauty products. 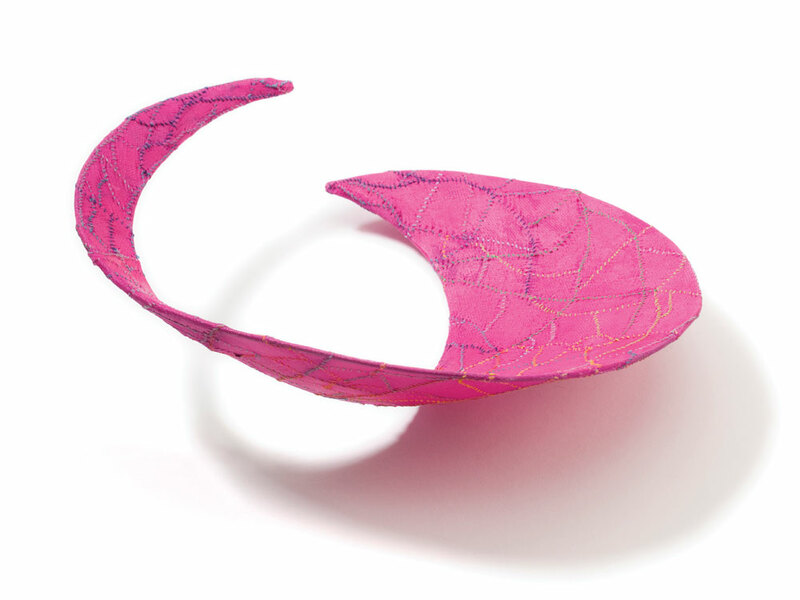 Grubow, who owns about a dozen Urso pieces, describes them as "packable," comfortable, durable, dramatic - and emboldening. "It becomes such a distinctive statement about me," she says. "Her work empowers me and helps me by communicating the type of work I do." Those who admire Urso's sculptural talent wonder whether she'll follow the trajectory of her husband, whose towering copper goddesses stand sentry outside their house. But Urso says she'll stick with jewelry. Sculpture stays in one place, she notes, "but jewelry can go anywhere on the people who wear it." Other fans wonder whether success could cause her to shift from one-of-a-kind to production pieces. But Urso insists that won't happen. 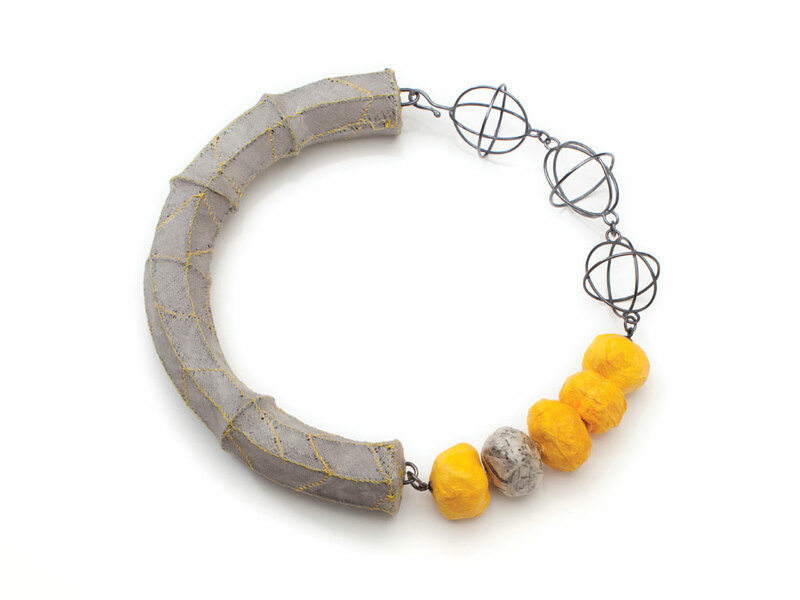 "I started making jewelry to be joyful and peaceful, not to be ambitious." Sebby Wilson Jacobson is a writer, editor, and journalism professor in Rochester, New York. Modest materials, deep cultural roots, and years as a curator are the secrets to her success. As a child, Tanya Aquiñiga straddled the line between Mexico and the United States. 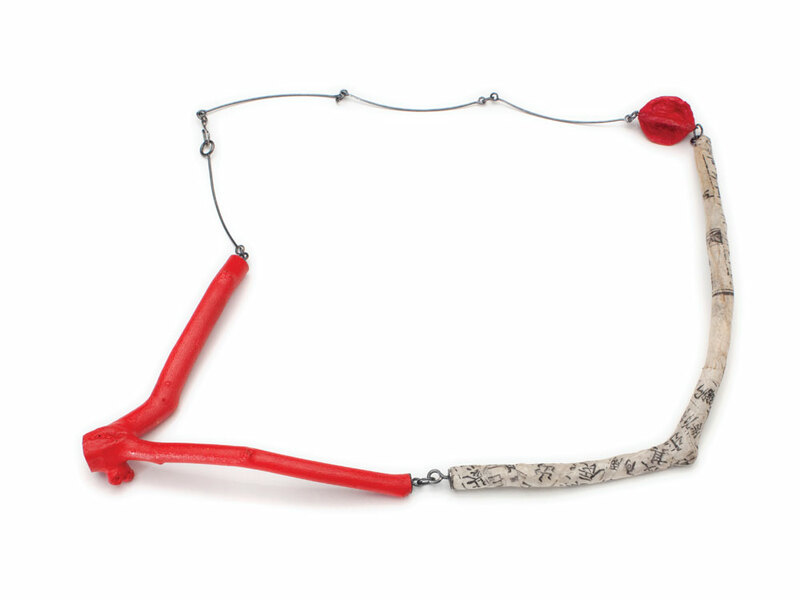 Now her exuberant work crosses boundaries between cultures, materials, even genres. The once-snubbed material makes a grand entrance in the art world.